Sustainable supply chain practices have been adopted by numerous organizations around the world and continue to grow by selecting innovative solutions coupled with modern technology to achieve a greener environment while maximizing costs. Supply chain management includes multiple functions ranging from forecasting and demand management to transportation operations and customer service. The following chapter explains each function along with a case study to depict how various strategies have improved the profits of a firm while trying to save the environment. 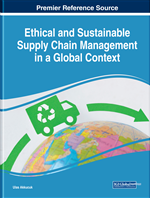 Prior to the 1980s the term supply chain management did not exist. Instead, organizations used the phrase “operations management” and “logistics” to define the entire network of supply chain. During the old days, logistics referred to functions such as procurement of raw materials, the maintenance of the products, distribution of products as well as management of inventory whereas modern supply chain management can be defined as a combination of the traditional logistics and introduction of new functions such as marketing of final products, research and development of new products, order management, finance and managing good relations with all suppliers and customers alike. Supply chain management can be briefly described as the coordination and integration of multiple individual functions, processes and departments that must be linked together to ensure the supply chain gives the firm a competitive advantage while assuring the right product with the right price has been provided to the customer for their satisfaction.